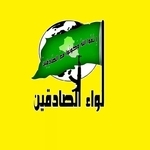 Liwa al-Sadiqeen ('The Truthful Ones/Upright Ones Brigade') is an Iraqi Shi'a militia that has claimed operations/intentions of operation in the Yusufiya area (south of Baghdad), the periphery of Samarra and the Abu Ghraib area, west Baghdad. Ideologically, the group seems to show reverence for Ayatollah Khomeini (founder of the Islamic Republic of Iran) and Hassan Nasrallah (leader of Hezbollah). Like most Iraqi Shi'a militias, Liwa al-Sadiqeen defines itself as part of the "Islamic Resistance" (al-Muqawama al-Islamiya). A Facebook page has also been set up claiming operations in Syria, though little meaningful evidence as of present points in that direction. The group may have overlap with other pro-Khomeini militias like Ansar Allah al-Awfiya', as demonstrated by a recent 'martyrdom' overlap involving one Sheikh Ghazwan al-Zaidi.